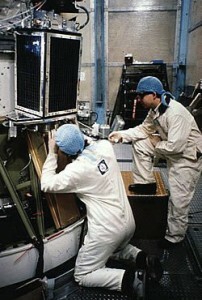 In just six months time engineers at the University of Surrey developed, built and launched on 01-03-1984 UoSAT-2 as a piggyback payload aboard a U.S. Thor-Delta rocket carrying the LANDSAT-D earth observation satellite from Vandenberg Air Force base in the orbit. 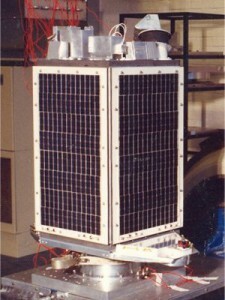 With 70 kg was UoSAT-2, the first satellite with advanced digital “store-and-forward (email)” communication with back-programmable microprocessor and contactless memories. To include different payload experiments: a speech synthesizer (Alker digit), with the messages or telemetry values can be output, a CCD camera and radiative and particle sensors. With RO-11 were carried out long-term studies of radiation effects on VLSI electronic components and scientific Liche releases. UO-11 telemetry transmits with 1k2, 7 data bits, even parity, 2 stop bits, the output power is 500 mW. Surrey’s second satellite “celebrated” his 21st this year Birthday in orbit. After a long periode of silence UO-11 turned on again on 30 July. The telemetry shows, however, that all analogue channels have failed. The status of digital channels show correct values. The On-Board Clock goes back a few days. The signal strength is much worse than before. As long as the watchdog timer operates, the beacon will be active in a 10-day rhythm. The S-band beacon is off.